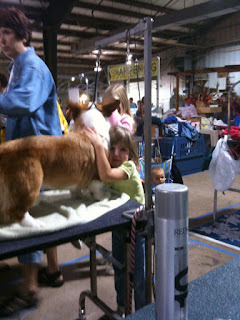 A couple of weeks ago, we had an all breed show here in Chattanooga. The same weekend and in the same park, there is also an AKC Lure Coursing trial. Lure coursing competition is limited to sighthounds, but after competition is completed for the day, sometimes they allow other dogs to run the course. Spencer is obsessed with lure coursing. We have friends who have lure coursing equipment and sometimes, when we beg enough, they will set it up so that we can play. As soon as he hears that "zip zip zip" sound that it makes, every nerve in his body springs to attention. So - we managed to get to the lure coursing field just as they were running Best in Field. I checked in at the show tent and they said sure - little guy can have a run. So we wandered over the course start, and a very doubtful fellow took one look at Spencer's little short legs and laughed. But then he noticed that Spencer had locked his eyes on the plastic bags tied to the cable (the "prey"), and the guy wiggled the wire enough to make the bags rustle. Spencer just about jumped out of his skin. He asked me how much of the course I thought Spence would do. "All of it," I replied. He looked doubtful, but said ok and jumped up in the back of his truck where he could see the whole course and run the lures. As soon as I let go of Spencer, he took off and ran his heart out. He covered the entire course and when he finished a huge cheer went up from the hound folks. As we were leaving, I ran into a couple of handlers I know from Obedience who ran their deerhounds at the trial. 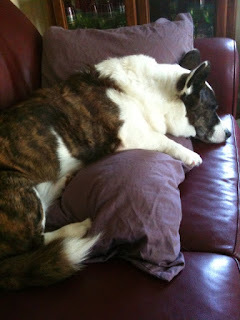 One said, "Thanks for embarassing us - your corgi just finished a course our hounds couldn't run!" The trial photographer was still there and got some great pics here, here and here. BTW - this field and the rest of the park is now underwater after the floods we had over the weekend. This is the Cinderella dress I made for Avery last year for Halloween. Glad I made it a little big because she can still wear it. Her dad sent the picture - apparently she just felt the need to feel like a princess Saturday. 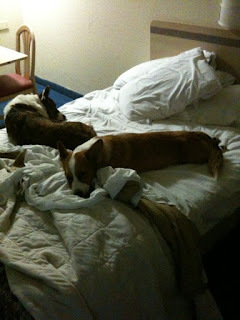 After an early potty trip outside this morning, they take up as much bed space as possible. Spence is really limping this morning, not wanting to put weight on his front right. Guess we will be looking for the show vet. Scout doesn't show until 2, so long day ahead. 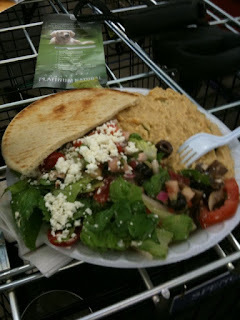 Plate full of Greek salad and hummus -$5! And Scout BOB - priceless. I was so looking forward to stretching out for a nap . . .
show just down the street from your house! ), but someone else had the same idea and beat me to it. In Atlanta a couple of weeks ago, I posted that Scout had started blowing coat. I left her with Cheryl, and they went to a couple of shows. Every day Cheryl posted me on how much more hair had come out. One day, after the judge examined her on the table, Cheryl said the inside of his coat sleeves were white from her shedding hair. I picked her up today and was amazed (appalled!) at how nekkid she is. She looks so tiny without her full coat. 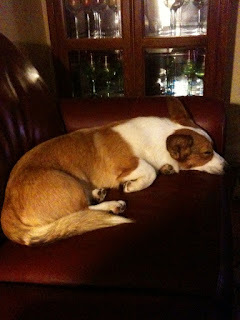 The thing with red dogs is how much their color changes when they are out of coat - Scout goes from a rich red to apricot. Her tail and pants are in ok shape, so this week she will get lots of cold baths, daily treatment with Cheryl's secret hair growing potion (she won't tell me whats in it, but it's blue and in an olive jar, which I have to keep in the refrigerator), and I stopped at the veggie stand today and bought sweet potatoes, carrots and beets to add to her food.